Frequent WinstonWanders readers may notice I don’t eat sweets very often. I don’t know what it is about them, but I’m just not drawn to sweet foods very much, so you should realize that it’s a particularly special occasion when I do find sweets that I love. Right across from the Museum of Modern Art in the Union Square area of San Francisco, there’s a small, but hard to miss shop with bright yellow signage covered in friendly doodley illustrations. 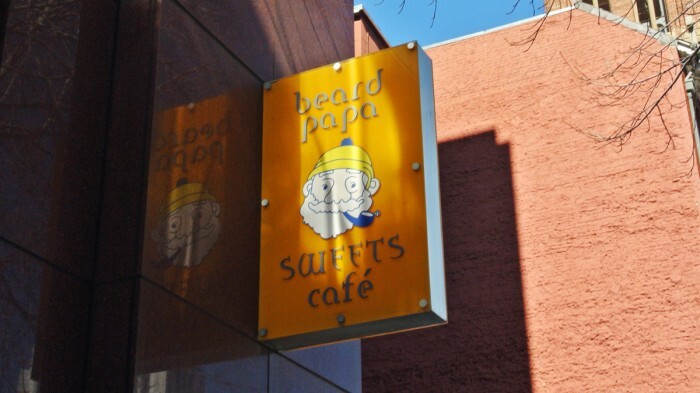 This shop, called Beard Papa’s, specializes in none other than cream puffs which are individually filled with cream to order. 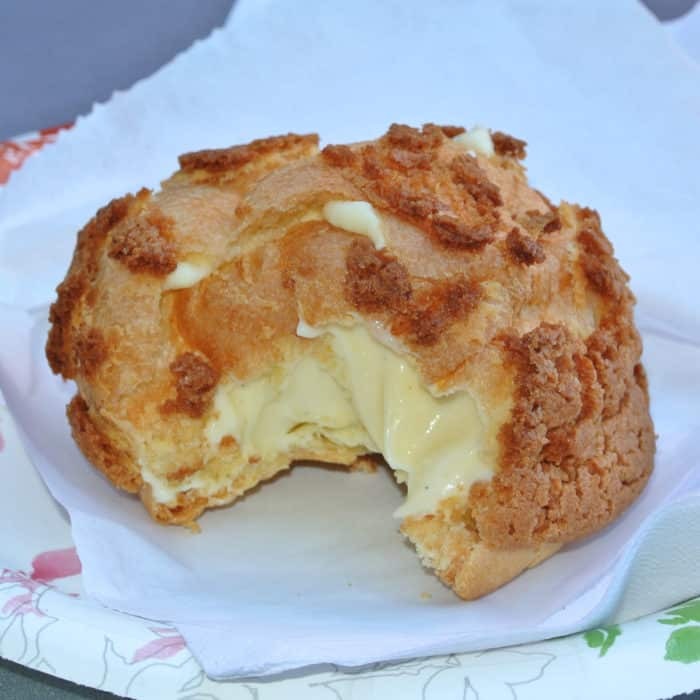 Beard Papa’s does in fact offer other non-cream puff treats, but honestly that’s not the reason to come. 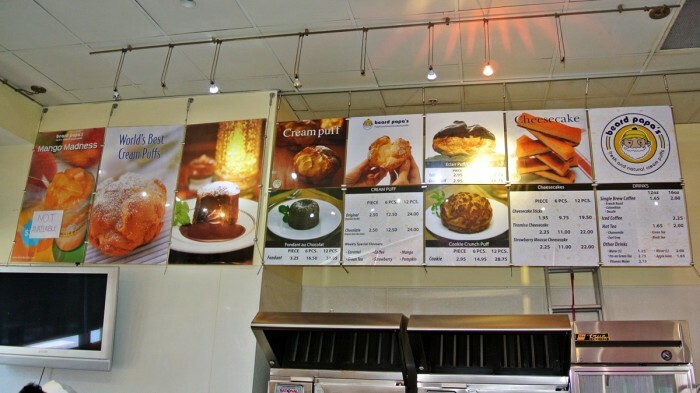 So I limited my selection to the cream puff options, which didn’t really limit me all that much because with three pastry exteriors and eight cream filling flavors there’s 24 different options to choose from. I decided to keep it relatively straight-forward and chose the Cookie Crunch puff exterior and paired it with a classic Vanilla Cream filling. I figured it would be easiest to judge these pastries with traditional ingredient selections. And I’ve gotta say, I was really impressed. I was so glad that they were restrained with regards to both the pastry and filling sweetness. Like I said, I’m frequently turned-off by excessively sweet treats, so this really hit the spot for me. 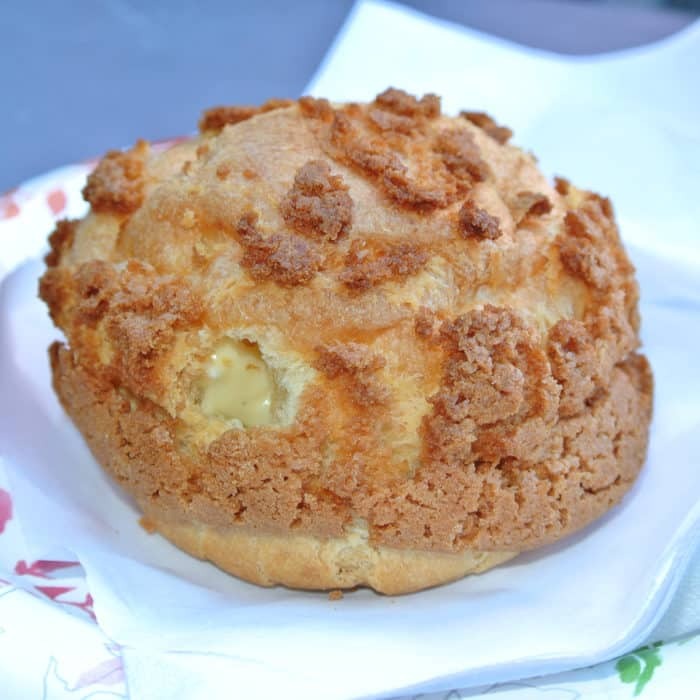 The flaky, crumbly pastry exterior was crispy, delicious, and absolutely loaded with that creamy, vanilla-flavored filling. I don’t think this dish would necessarily wow everyone, particularly the sweet-obsessed, but for me it was perfect. So, if you’re in the Union Square area of San Francisco and are looking for well-made, but not overly sweet treats, stop by Beard Papa’s. It may seem like a gimmick to individually fill these puffs to order, but I think the process actually serves it’s purpose of freshness and customizability quite well. 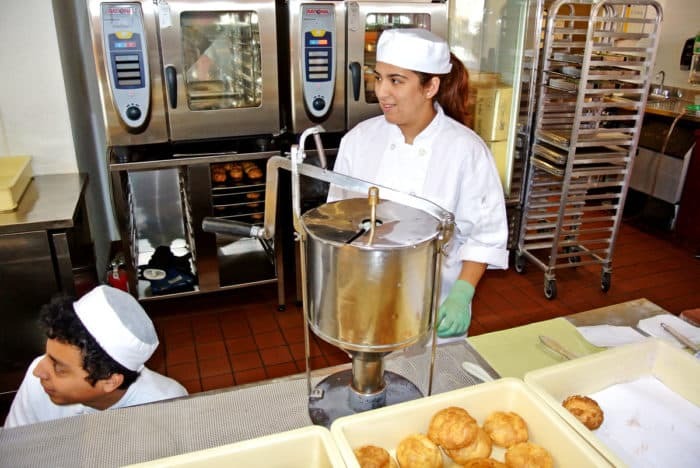 Got another great pastry shop in San Francisco I need to check out? Let me know in the comments below.